Middlesbrough could have long-term absentees Damia Abella, Alex Baptiste and Rhys Williams all back in first-team training in the new year. 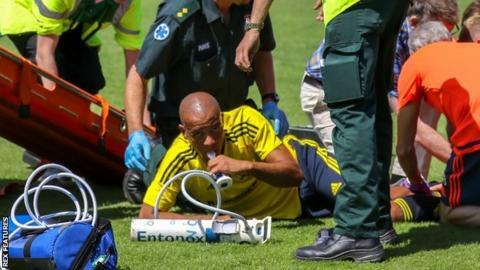 Defender Abella has been out with a cruciate injury for 15 months, while full-back Baptiste fractured his leg in two places at York during pre-season. Utility player Williams has been back in action for the under-21 side. The Australian has returned to training during his recovery from a second Achilles injury, suffered in January. "Damia will be back with the team in a couple of weeks, and Alex Baptiste should be back in January as well," head coach Aitor Karanka told the club website. Boro have the best defensive record in the Championship, having conceded only 12 goals, and will keep a seventh successive league clean sheet if they do not concede against Blackburn Rovers on Boxing Day. Karanka, however, is more interested in three points to keep the Championship leaders at the summit. "The main thing is to win the game, if we don't concede a goal it will be perfect," the Spaniard told BBC Tees. "But if we win the game 3-2 or 4-3 it's not a problem for me. It's difficult to score against us, and we have to keep going the same way." The trip to Ewood Park brings Boro up against one-time transfer target Jordan Rhodes, the nephew of Karanka's coaching colleague Steve Agnew. "He was a player who - we are not stupid - we know he's a top scorer in this league," said Karanka. "He's a good kid, I know because his uncle is my assistant, I've never met him but I think he could have improved our squad. "We didn't sign him, but we signed David Nugent and other players, and we are now top of the table which is the main thing."